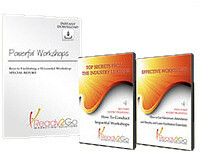 Audio Training Program: Overcoming Procrastination - The Art Of Getting Things Done Now! from Ready2Go Marketing Solutions, Inc. The Art of Getting Things Done Now! If your clients are tired of feeling defeated when they think of all the projects they’ve left half finished, or all those dreams they’ve never started, it’s time to take heart - they have you to help them through. Everyone procrastinates to some degree. But left unchecked, procrastination can grow to be a crippling habit that can rob people of confidence, opportunity and the ability to achieve their dreams. Every missed window takes its toll and strains self-worth, motivation, finances, health and relationships. Your clients can soon be on their way to banishing that defeated feeling forever. This 6 part audio training will help your clients build more trust, opportunity & confidence in every aspect of their lives. These enlightening audio downloads are chock-full of valuable information that your clients can use right away to help navigate the challenges of life, both internal & external. They will grow stronger, more aware and more dependable with each audio module. Audio #1 – What is Procrastination? Audio Training programs are a powerful tool for keeping in touch with your clients and prospects, and delivering great value. 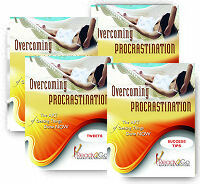 Order the Overcoming Procrastination audio training program today.